When artists creates a new work they begin weaving without having a fixed pattern in mind. Each one of their creations is improvised, and therefore unique. It captures the tapestry of a particular time. Kilim products are pieces of inspiration. That is why the use of colour is the cornerstone of the art of kilim; for colours connects us, through our inner lives, to our surrounding spaces. They capture the texture of our memories. They’re what our imaginations feel like. Our kilim artists are masters of weaving unique moments out of colour. And that is why we are sure you will find a unique creation among our kilim products to suit you. 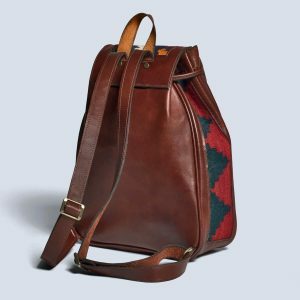 Our collection of 100% handmade and handcrafted Persian kilim and leather bags, cushions and ottomans is unique. Lotus products are expertly handcrafted using natural leather and shipped worldwide from our Australian owned online store. Made from genuine brown leather and featuring a simple, sleek design, this multipurpose bag is both practical and stylish—perfect for the professional working man or woman.